There aren't too many days in a week when I can focus on actually making more than one thing in my kitchen. But after two weeks of moving and travel, I decided it was time to break in my new (to me) stove and oven for the first time. I really enjoyed staying home to prepare a great lunch for my husband and dinner for two of our dear friends. To pick up everything I needed, I trekked out to Fresh Market and stocked up on vegetables, herbs and items from the butcher. Armed with a list and some ideas of what I wanted, my entire plan changed when I saw their gorgeous array of in-season strawberries at a fantastic price. I bought nearly 3 pounds and headed home to research what I was going to make with all those berries. Turns out, the net is filled with ways to savor the strawberry. Simple things like tossing a few slices into a spinach salad or serving with whipped cream are a given, but I was feeling more adventurous. I found a fun recipe for a sparkling strawberry limeade in my latest edition of Cooking Light and another for an old-school strawberry cake with butter cream icing on Southern Living's website. I also found these 25 ideas for strawberries so the leftovers won't go to waste. I chose just two recipes for the day and then sliced up a few of the ripest berries, sprinkled with balsamic vinegar and black pepper (delicious) to snack on while I worked. About 1/2 hour prior to our guests arriving for dinner, I put the items below into a blender. 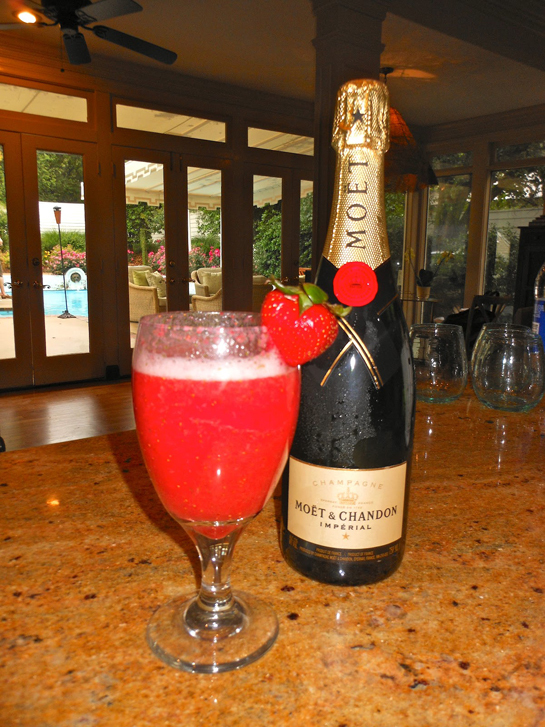 Once everyone arrived, I grabbed the blender out of the fridge, poured the concoction in equal amounts into four glasses and filled with equal parts champagne. It was a big hit, and a great starter on a warm evening. 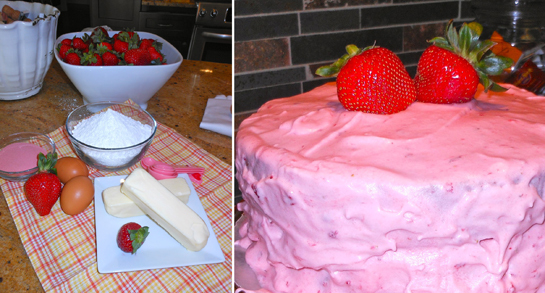 Strawberry cake with butter cream icing, before and after! The cake was a breeze to make! I altered it a bit, adding more berries to the batter and a tub of whipped cream cheese to the butter cream recipe. The taste was perfect, but it was honestly a little sad looking. I hoped no one would question it, all the bumps and uneven spots were on purpose, right? But, hey—this was not for an event and I'm no baker so I reveled in the fact that it got rave reviews from my tasters after dinner. My husband even came back to the kitchen for a second piece late night. The recipe is that good (and easy). Now, will I keep baking cakes? Doubtful. 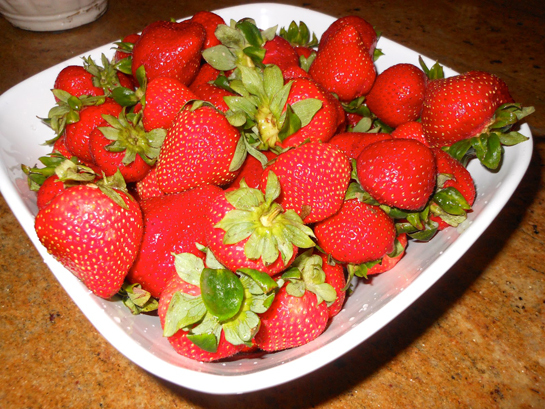 But paying homage to strawberry season is fun and I definitely encourage you to do the same while these super spring fruits are their sweetest.